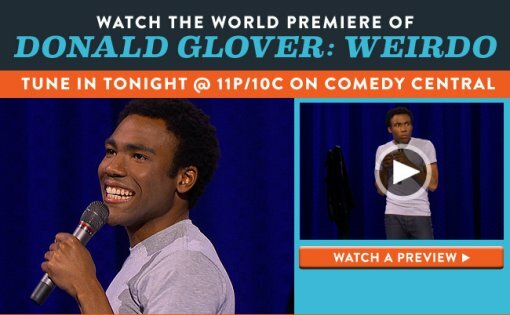 Tune into Comedy Central tonight at 11PM for the premiere of comedian, actor, writer and rapper Donald Glover‘s brand new one hour comedy special, Weirdo. Filmed at the Union Square Theatre in New York City, Glover shares his unique childhood tales about his unrequited love for Cocoa Puffs, his burning desire to voyage to Toys”R”Us and the ins and outs of the N word. Glover utilizes his unique brand of comedic storytelling and a keen youthful narrative to churn out an uncanny amount of guffaws in his first-ever COMEDY CENTRAL one-hour special. Donald’s rap alter ego, Chilidish Gambino, released his debut album Camp on November 15 via Glassnote Records. According to Billboard, Camp will debut at an impressive No. 6 on the Top 200 album charts.